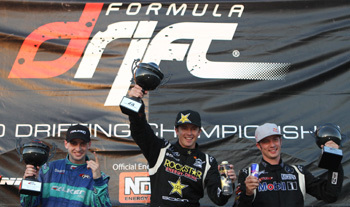 Long Beach, Calif. – July 10, 2010 – Formula DRIFT entered Evergreen Speedway for Round 4: Throwdown in Monroe, Washington. Tanner Foust takes the victory and moves into second place overall in the Pro Championship standings, while taking the lead in the chase for the Tires.com Triple Crown. Evergreen Speedway hosted Round 4: Throwdown to a packed stadium. Fans gathered to watch the exciting competition under the clear skies and warm sun. Attendance increased from past seasons proving the growth and popularity of the sport in the Pacific Northwest is as strong as ever. Round 4: Throwdown brought exciting drifting action back to the Pacific Northwest with Tanner Foust in the Rockstar Energy Scion TC taking his first victory of the season moving him into second place overall in the Pro Championship standings. Foust also takes the lead in the second event of the Tires.com Triple Crown with the win. The final battle paired Foust with Ryan Tuerck in the Mobil 1 / Maxxis Tires Pontiac Solstice, Tuerck crashed into the wall coming off the banking on the second run giving Foust the victory. The consolation run showcased Darren McNamara in the Falken Tire Saturn Sky against Michihiro Takatori piloting the Drift Emporium / BF Goodrich Nissan S13. McNamara edged out Takatori to take third place.